In all your conversations with a farmer, how often does the term “clean room” come up? Or inoculation? How about spawn? Farmer Russell Lawson (of Patchwork Farms here on Bainbridge Island) recently gave a tour of his new mushroom cultivation facility and it is a far cry from the soil and seeds of his more traditional farm work. It starts in a clean room. Positive pressure built up by pumping clean air into a sealed room keeps contaminants out, allowing Mr. Lawson a sterile environment in which to begin. Bags of alder sawdust (and a few secret ingredients) are sterilized, then inoculated with the specific type of mushroom. After a day or two in the clean room, the inoculated bags move into a humidity and temperature controlled dark room where they hang out for 2 - 8 weeks, depending on the type. Once the bags are fully “colonized”, they are moved to a grow room where they are exposed to just the right spectrum of light to encourage fruiting. 2 weeks later: mushrooms. King Oysters. Lion’s Mane. Italian Oysters. Shiitake. 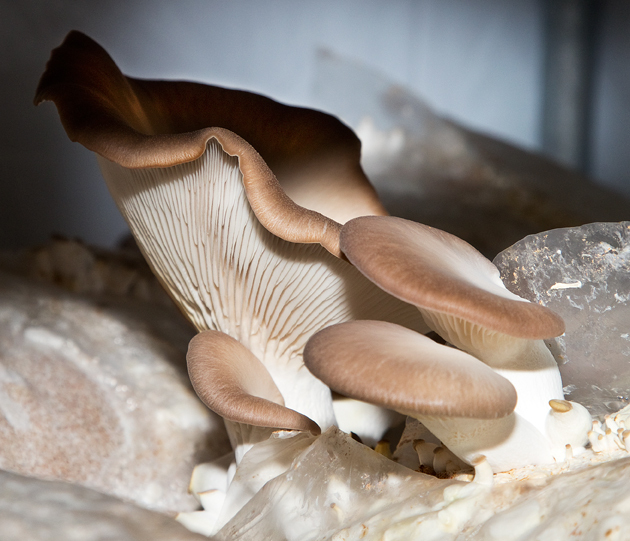 The mushroom farm, with its clean room and its grow lights, is in a converted garage near Hidden Cove. Mr. Lawson who has fields in several locations on the island, designed, engineered and built all of the facilities himself. Just steps outside the door, however, he has greenhouses, fields and what will be rows of tomatoes, cucumbers and more familiar crops. As well as a cheerful gaggle of chickens. Patchwork Farms’ mushrooms are currently being sold to Hitchcock, but will soon be available at Bay Hay and Feed, the Bainbridge Farmers’ Market, and through the Butler Green CSA. Given his estimate of a 40 pound harvest of mushrooms (or more!) a week, there should be enough to go around.